In the literature there is no clear definition of multi-line / long-term programs (MMP). MMP adopts gradual expansion capability, flexibility, and innovation. Multi-risk products (MMP) combine various risk categories within a contract so that a cost-effective and efficient solution for risk is available to the company. MMP programs are insurance instruments that pool the risks of several insurance undertakings in a single insurance contract. The large industrial insurers of the world provide MMP. The MMP program is also able to take on other risks that are usually not insurable in a traditional insurance contract, in addition to traditional insurance risks such as accident, liability and property insurance. These risks include interest rates, and fluctuations in commodity prices or the exchange rate. The main advantages of this type of product from the perspective of the policyholder are better rates and a reduction in administrative costs due to a reduction of complexity. In addition, there is less chance of over-insurance. The internal balance of risks and the codification of the contract with long-term also has a positive influence on the premium, which means the demand for MMP is quite high, especially in a hard market phase. However, it should be kept in mind that the availability of composite and long-term products is limited. The following example demonstrates the benefits of using an MMP contract. A traditional insurance program with horizontal and vertical layers: In this example, steel products for sale in Europe and the United States is the business of a fictitious British company called XY, which buys its steel in South America. Liability, property, and accident insurance, credit risk, steel prices, and exchange rates are the core risks to XY in this example. The company thus aims to protect its risks separately by means of a conservative insurance program. For a vertically layered risk transfer solution (in terms of order), the traditional exceedance insurance is typical. This is where risk transfer for loss begins for the contractual party, while at the same time, the company bears liability risks and financial loss risks relating to the core business. 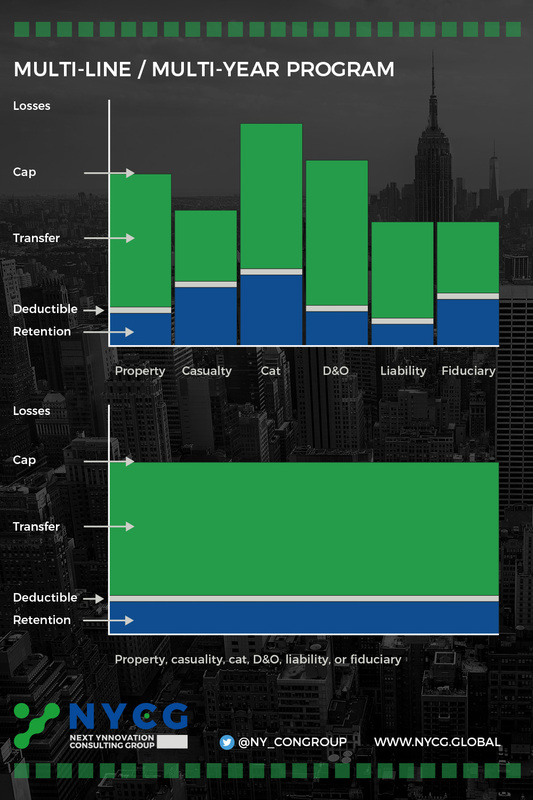 In our example, the coverage of financial losses is a vertical layer for XY, based on the order of compensation of various insurance companies in favor of XY. 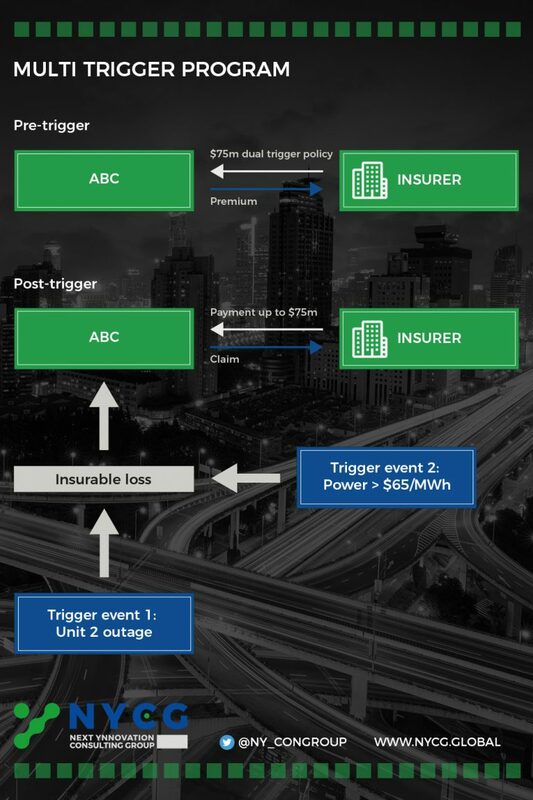 To illustrate this we construct the following scenario: Two different insurers offer coverage in two different (vertical) loss layers, while 200 million pounds are retained by an insurer. A first insurance company allocates these layers to cover all financial losses from 0.2 to 1.2 billion pounds. For property damage between 1.2 and 1.6 billion pounds, the second insurer offers protection on a vertical damage level. Regardless of the order in which the damage occurs, the exchange rate risk of the company could be horizontally layered up to 600 million pounds by a common protection for every dollar, or split between two companies. Thus, each backup party owes 50 pounds if XY loses 100 pounds from exchange rate fluctuations. Each of the partner insurance companies would have to pay 300 million pounds if a total loss occurs. Regardless of the order of the damage, the horizontal level is thus characterized by a common securitization partnership with defined percentages. For liability insurance, if necessary, there is another approach under consideration, in which mixed coverage insures the risk. Here, the company would have two insurance policies, each with a limit of 700 million pounds, for the first 600 million pounds of its non-borne liability risk, as well as a 100 million pounds deductible. 400 million pounds could then be compensated by XY via a third policy, provided there is catastrophe risk coverage of 1.6 billion pounds, with a 100 million deductible. The third policy is out-of-the-money and the first two are entirely consumed once the XY Company loses 750 million pounds in one year through damage. The core problem of split coverage is clearly illustrated in the example of the XY company. Due to the excessive use of capital that the program requires, the horizontally or vertically layered area-by-area transfer program is not sufficiently efficient. In the event that major damage does not perfectly correlate in time, XY covers too great of a capacity, insofar as the company must pay 70 million pounds for the protection of its fixed assets and 50 million pounds for foreign exchange coverage. The risk of total loss for the XY Company is lower than the sum of the combination of these two risk areas on the basis of the adjusted portfolio with regard to correlation. If the two maximum covered damages do not simultaneously occur in both areas, the company XY does not require the total 120 million pounds. The advantages of a multi-line solution hereby become apparent. In order to cover only the risks that the company would like to transfer to an insurer, in this case XY must pay significantly lower premiums and receive a tailored insurance concept. There are also potentially effective ways to bridge the gaps between the different areas in the multi-line program, insofar as the gaps may be caused by factors such as inadequate formulation, an error in the definition of risk, or unplanned excesses. Long-term agreements or annual terms are possible for the conclusion of multi-line product contracts. Long-term policies are generally preferred because they are a good way to pay lower premiums during a hard market phase and they also simplify extensions and new contracts. Multi-trigger program (MTP) payments for damages are only made if two scenarios occur during the contract period. Here a distinction can be made between the first (insured case) and second trigger (non-insured case). To counter the risk of a moral hazard, the second event is usually based on an index beyond the control of the policyholder. Because the insurer only has to pay compensation if both triggers occur, this type of premium can be kept low for a cover. For large companies, MTP insurance companies are of significant importance as they provide protection against possible insolvency, for example in the event that large damages occur (e.g., a rise in commodity prices and a fire in the same year). MTP are usually conceived as long-term insurance contracts with potential triggers designed in changing, variable, and fixed ways. Triggers that merely represent a barrier to the occurrence or non-occurrence of the event are referred to as fixed triggers. As such, they do not usually affect the value of the contract, but merely indicate whether a contract pays out or not. If the value of the payout from the level of the trigger is determined with respect to a defined event, this is called a variable trigger. If part of the company is doing well, it can carry a higher risk for a trigger or vice versa. This is called a changing trigger, which varies depending on how a trigger develops in the portfolio on the basis of individual risk exposures. Multiple triggers provide payment only when the second (dual) event occur, the likehood of a payment is lower than for similar multiple peril contracts, meaning that the cedant optains cheaper protection. For instance, if there is a 10% likelihood of damage to a power plant and 10%likelihood of power prices rising above $ 100 per megawatt (MWh), there is only a 1% probability of both occurring at the same time and triggering a payout. The lower probability of payoff means that risks that might have once been considered uninsurable are made insurable. A utility provider with a dual-trigger policy will only receive payment from its product partner if two events occur simultaneously: if the tariff for electricity exceeds a predetermined limit due to the duration of the device failure or because of a storm and causes a power outage due to a technical defect or hurricane damage. Connecting the credit risk of a major customer with the price of electricity is another type of dual-trigger policy; the bankruptcy of a major customer in connection with a decline in prices for electricity suppliers would be a significant financial burden in this case. The use of an MTP tariff by a hospital was approved. Under the agreement, the policyholder receives compensation if the value of the equity portfolio of the hospital falls below a predetermined level, and if the claims due to malpractice in the same phase are above a specified value.